Slow Cooker Chicken Udon Noodle Soup – this chicken udon noodle soup is a big bowl of comfort food! The amazing Asian broth with garlic, ginger, star anise, cinnamon, black peppercorns and more simmers away all day in your crock pot filling your home with the most tantalizing aroma! We have had our first cold snap of the season and I have to say that even though my dishwasher is my most favorite thing in the whole world, the remote start on my car is a close second. There is nothing nicer than to get in an already warmed-up-a-little car. Cold weather also means the slow cooker has come out for the season. Slow cooker = soup most of the time in my house and this past week was no exception. I’ve already made Slow Cooker Chicken Pho and Slow Cooker Beef Pho, but I was looking to try a different recipe. I found this recipe in an old 2010 Donna Hay magazine. I loved the sound of the Asian stock. The secret to this udon noodle soup or any type of pho is the Asian Stock or Broth. It’s the long simmering of a variety of spices, such as star anise, stick cinnamon, and whole peppercorns. This recipe was a little unusual in that it included Chinese Five Spice powder and oyster sauce. Some recipes have you roast the bones ahead of time, this recipe is easier, you just put a whole chicken breast in the pot to simmer away in the broth. This easy chicken udon noodle soup is amazing! The broth gets so much flavor from the spices. It is pure comfort food! If you can’t find udon noodles, you could sub ramen or even spaghetti or linguini. Put all of the spices in a piece of cheesecloth and tie it closed. It makes it so much easier to pull out the spices at the end instead of trying to strain them out. This is a great way to use up cilantro stems. I save them in a ziploc bag in the freezer just for soups like this! If you don’t have rice wine, a pale dry sherry or a dry white wine will work. 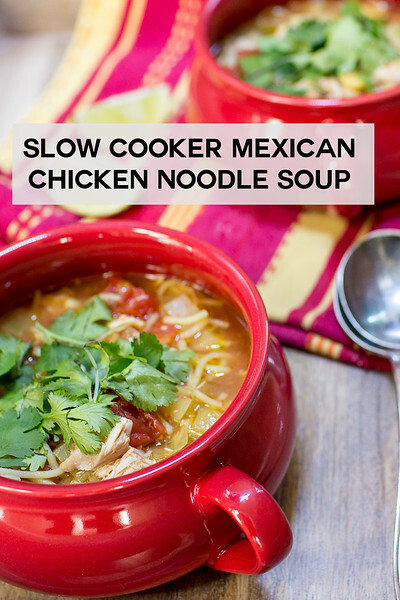 This Slow Cooker Mexican Chicken Noodle Soup is another easy family favorite! 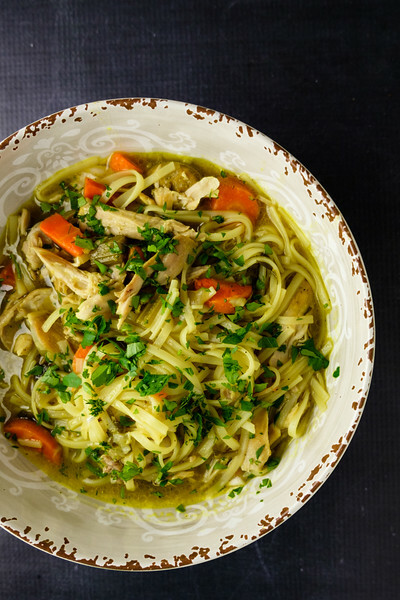 This Instant Pot Chicken Noodle Soup tastes like it’s been simmering all day, but it’s ready in about an hour! 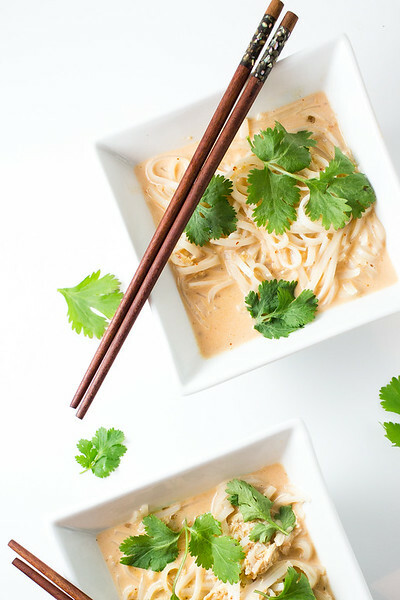 These Slow Cooker Curried Noodles are so easy and gets rich creaminess from the coconut milk. This Slow Cooker Chicken Udon Noodle Soup makes and amazing big bowl of comfort food! Place all of the stock ingredients in your slow cooker and set to low. Placing all the spices and the cilantro roots in a cheesecloth pouch makes it easy to pull them out later. After about 8 hours, remove all of the solids from the stock and add the bok choy. Cool the chicken slightly until you can pull the meat off, shred and return to the stock. Meanwhile, cook udon noodles as directed on package, drain and add to slow cooker. Spoon into bowls and top with fresh red chili and fresh cilantro. All the different spices in this sound wonderful. Warm and hearty and just the best thing for this time of year. It really is so flavorful and comforting! Sounds like a whole lot of good flavors going on in this soup. The perfect bowl of comfort food for the cool weather. It is filled with flavors! So warm and comforting! The perfect soup for this wintry weather. Love this ! I am a huge fan of udon soup, so I will definitely give this a go. I need to pick up some star anise though. I have never bought it before, but I have a feeling that it will put this dish over the top. Oh it definitely makes the soup. I bought a bag of it and sealed it so it stays fresh. 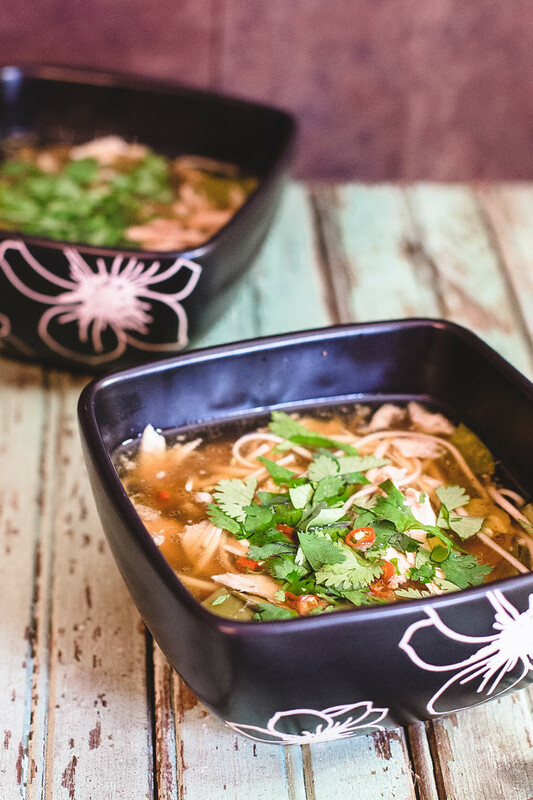 This chicken udon noodle soups sounds like the perfect way to end a long day. Love the tips about the cheesecloth and cilantro stems. I always trash them but now I’ll be saving them. Yes, put them in the freezer, they are also great in chicken tortilla soup! Sounds delicious, I need to run to Sunshine Market to get some noodles. Thanks for sharing it with Souper Sundays! I love a good udon noodle soup, so I’m definitely trying this. This Asian stock recipe sounds sensational, and now that I’ve discovered the wonders of making dumplings I’m even envisioning wonton noodle soup. What wonderful, refreshing looking soup. I could eat this every day. I’m such a Donna Hay fan. Thanks for this recipe Pam. Love those little bowls. That soup sounds exotic and delicious. Love the combination of dried spices and fresh ingredients. I think I made a Dorie Greenspan broth similar to this one and it was a big hit. Added an extra layer of warmth that normally isn’t there. Looks really good! I’m intrigued by the Donna hay app – I have been using my iPad in the kitchen more an more, so I will have to check it out. 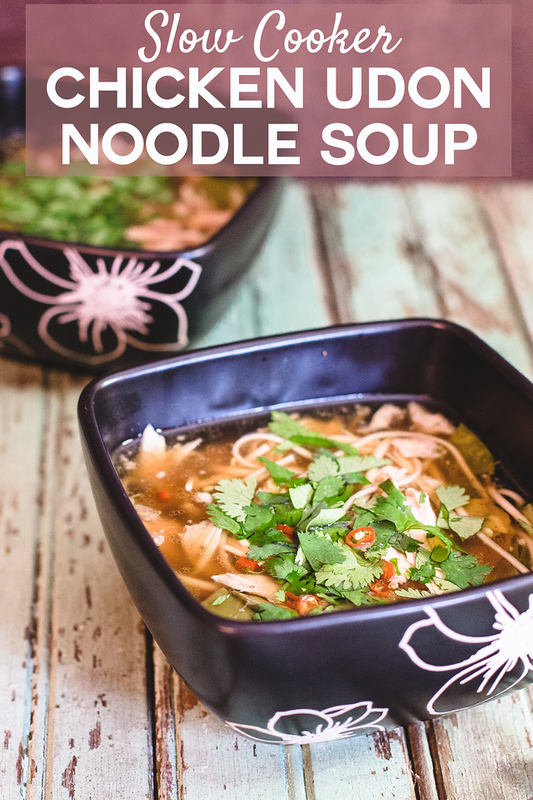 Your noodle soup looks delicious! That is a lot of Chinese rice wine! A bowl of this lovely soup is just perfect for cold wintry nights! And I love your pretty bowls! What a beautiful soup! So many bright flavours! Noodle soups are really so satisfying when it’s cold … all that slurping and going back for seconds … so cozy! Soup is good…that looks exciting and new to me, will give it a go…the only reason to have winter is to make a lot of soup (which we love). lol Will look into that DH ap, thanks for the tip. It is definitely cold enough for noodle soup here! I love the rich flavors in this! I’ve made that…it was delicious. Love your bowls and your presentation is perfect!